Our Standard Organic Natural Wool Mattress Topper is approximately 2 inches thick. Select this topper if you need a delightful soft surface added to your mattress or futon. Our Deluxe Organic Natural Wool Mattress Topper is approximately 4 inches thick. Select this topper if you want the ultimate in luxury and comfort. The problem you may have with the Deluxe Topper is you may not want to get our of bed in the morning! Some manufacturers add "natural" flame retardants to their outer topper fabric (this fabric is also known as "ticking") such as boric acid. However, we strongly recommend against these products as they still may pose their own set of hazards to one's health and well-being. By contrast, a natural flame retardant we do recommend for those who are interested is our pure and natural chemical-free wool. Because wool acts as a flame retardant, our wool toppers (top mattresses) do NOT require a prescription. Our chemical-free natural wool is from free-range sheep and no chemicals are ever used on the sheep or in the processing of the wool. The wool in our toppers will satisfy the federal flame retardant requirement. Wool also adds resiliency and improved thermal comfort (cooler in hot humid weather and warmer in cool dry weather), and anti-microbial benefits from the natural lanolin in the wool fibers. Wool also helps (just a little) with dust mite resistance as it. However, if you are concerned about maximizing dust mite protection for your topper and you, you will still want to add an Organic Cotton Dust Mite Barrier Cloth Cover to your order. Our USA grown pure and natural wool is processed without bleaches, carbonizing acids, formaldehydes, dyes, or animal cruelty. 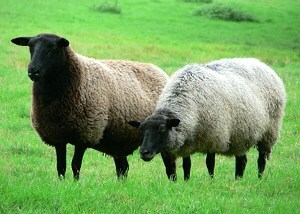 The sheep are raised cruelty-free and allow to roam free on the range. The sheep and the wool are raised in chemical-free and pesticide-free environment. In fact, the wool is completely untreated is except for being washing with water. While not "certified" organically grown, the sheep and wool are grown and processed according to organic guidelines. The picture at the top of the page shows an AbundantEarth.com Topper on an Abundant Earth Futon is for illustrative purposes only. The mattress and platform bed are not included. Please allow approximately 2 to 5 weeks for delivery.